Claw-pole is a key part of the automotive generator and also the main component forming a rotating magnetic field. Shown in below picture, the shape is very complex with six high and sharp claws. Its shape and electromagnetic properties directly affect wave form of the induced EMF and power generation capacity of the AC alternator, so size accuracy is highly required. Although there are lots of suppliers for forging claw pole, there still exsit difficulties to make this part, such as the process is multi-step and long, lifespan of the mould is short, cost is high, and the quality is hard guaranteed. The main reasons are that the top of claw-pole is hardly completely filled, loading of the forging is heavy (more than 1000 tons), consumption of the burrs is high and the flow line of metal is complex. How to form the top of claw-pole with lighter loading, reduce the material consumption and make the flow line more conductive, all the above issues are the key difficulties in producing claw pole. For such a complex shape, it might be manufactured by both casting, forging and stamping methods. 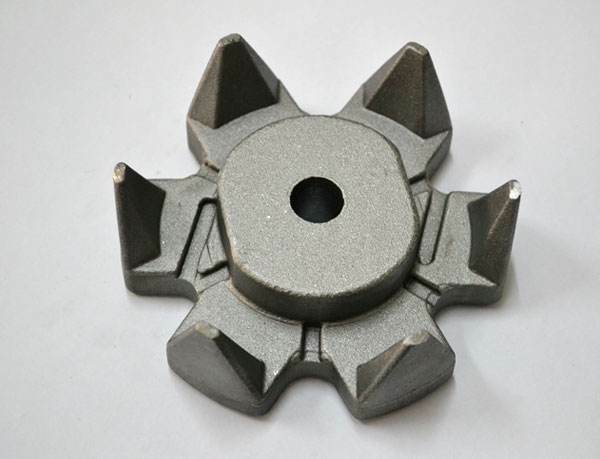 For casting, although the shape can meet the requirement, its loose cast structure, contraction cavity and other defects will reduce the electromagnetic property of the claw pole, which affecting the car's power generating capacity. For stamping, tedious process, low coefficient of material utilization and poor electromagnetic performance are its defects. Moreover, stamping is only workable to those thin sheet claw pole without boss at the centre. Therefore, closed die forging is gradually introduced both at home and abroad to make claw pole with good working performance. At present, the widely-used forging process have many steps: cutting → heating → upsetting→pre-forging →final forging → trimming → annealing→ phosphorization and saponification → finishing. The process is too long with many steps and low efficiency. Although the pre-forging process can reduce the forming loading, the pre-forging and final forging still need more than 1,000 tons of friction press machine. Due to the large tonnage, the life span of the mould is too short in the actual production. (3) The claw takes its basic shape in the forging process, its shape after thermal contraction only needs trimming in the cold- finish process. Only a 400-ton press can achieve it. First remove mile scale after annealing (annealing by afterheat), and then carry out cold-finish process, skipping the heat annealing and phosphate & saponification in conventional cold-finish process. In addition, the closed die is used in forward extrusion, its shape is formed to be a split die with a prestressing outer ring. In actual production, cooling of the die and clearing of the oxide skin are also should be done timely. Fly Drop Forging can produce different types of claw poles, pls contact us if you are interested!